I don't consider myself to be very old, but considering the advancements in technology over the last 20years, I might as well have grown up in the Stone Age. Sure, I had a computer, and we would play games on it (that came off of actual discs that were actually floppy!) but only for a few hours a day and that was it. Now kids are on computers constantly, thanks to smartphones and tablet. It might seem somewhat reactive to say that it’s stunting the way that children interact with the world, but it's at least changing it, and not, I believe, for the better. 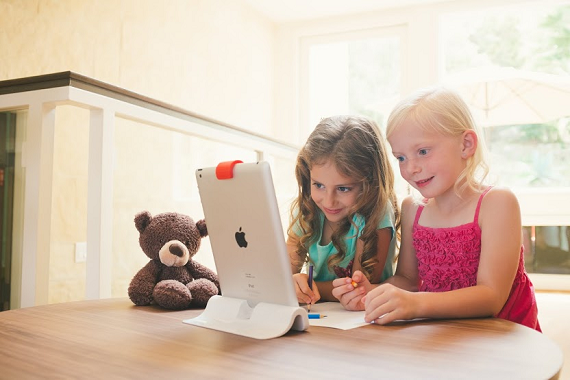 That problem was the inspiration for Osmo, a hardware games device for kids that connects to any iPad and allows children to use it to interact with a real world environment. The company, which made $2 million dollars in presales before shipping last month, has announced that is has raised $12 million in Series A funding. The round was led by Accel Partners, with participation from Upfront Ventures and K9 Ventures. As part of the investment, it was also announced that Rich Wong of Accel Partners will be joining the board of directors at Osmo. Osmo had previously raised $2.5 million from K9 Ventures and Upfront Ventures, bringing its total venture capital funding to $14.5 million. The idea for Osmo came from Pramod Sharma, CEO and co-founder of the company, after he noticed how much his five year old daughter loved her iPad. "She had her faced glued to screen, which seems unhealthy and not natural," he told me in an interview. "There was a limitation of how the interactions she could have with the iPad." The idea behind Osmo was to then expand those interactions so that they were no longer limited to just the screen, but to the area around the iPad as well, as a way of allowing children to interact with their environment. Osmo is a reflector that snaps over an iPad's camera, which acts as a specially designed mirror that translates real world actions into a digital environment, which are then used in games that the company also sells. For example, one of Osmo's games is called "Words" and it involves two teams taking physical letters and spelling out words of what is appearing on the screen. A big part of Osmo is its design, Sharma told me, and the company has made a big effort to create a "magical" design experience. On top of that, their goal is to make the games both high quality and fun. "Where we set the bar is that we want Apple or better quality, with a Pixar level of fun," he said. The device has been tested in more than 150 schools, and the company takes the advice of teachers and school administrators as to what is, and is not, working. "We want educators to influence what we build. Educators are part of product cycle. We have heavily tested in schools and if teachers love the product then we don’t have to prove to anyone that it is good for kids," Sharma said. Still, the company is not making an active effort to sell directly to schools just yet. "We want to make schools a part of the cycle as much as possible, but we are not actively pursuing schools yet," he told me. "We are going by word of mouth, and there are already more than 2,000 schools using Osmo." The company so far has developed three games, and the new funding will go toward creating more. In addition, Osmo plans to build out its marketing team, with a plan to go from 13 employees to double that number in the next year. In addition to the funding news, Osmo also has revealed its first retail partnership, and it's a big one: Osmo is teaming up with Apple to sell the Osmo hardware in Apple stores. "Around the time we launched we had people from Apple people come and ask us to give them a demo. Apple has always been about a high quality experience," Sharma told me. "They have been in education, and in order to tap into that, in some sense they see us as helping to increasing the footprint of the iPad in education." The partnership is still early stage, he said, but he has "been amazed at how much support we’ve been getting, and how much product feedback." Tablets will evolve, and so will the partnership between the two companies. The Palo Alto-based Osmo was founded in 2013, and has more than 35,000 combined customers. Ultimately the company's goal is to change the way we interact with our devices. "Similar to what Apple did with touch screens, at first the iPhone was the only device with an amazing touch screen experience, what we're doing is that same fundamental shift," Sharma said. "We are going to go way beyond gaming, and beyond education, to change how you think of your device."